What: A shady retreat far from the bustle of "Tourist Prague"
Once upon a time, the legend goes, Princess Libuše had a vision. A dream of the future glory of the city of Prague, sited on seven hills. Though revered for her wisdom, the sensibilities of the time just didn't have room for a woman leader. She rose from her throne and dispatched a delegation to fetch her a common ploughman named Přemysl - who she promptly married. Together, from their fabulous palace at Vyšehrad, they founded 400 years of rule under the Premyslid dynasty. Today not much remains of the castle of the "Castle on the Heights." Perched on a rocky promintory out of sight of the teeming hordes crowding Charles Bridge, the sun-dappled pathways that wind through the ruins of Princess Libuše's home offer a welcome break from the crowds. 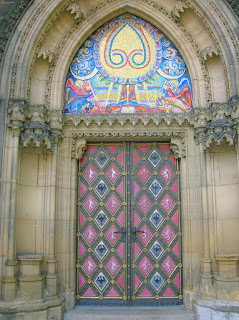 Most folks that actually make it up to Vyšehrad come to visit the 11th Century Church of St. Peter and St. Paul or the Slavin Cemetary housing the bones of Czech luminaries such as Dvořák, Mucha and Smetana. 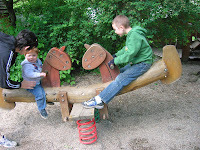 While those sights are fascinating, we came mainly for the playground! 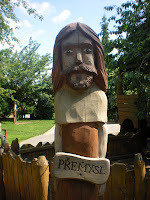 Tucked in a shady glade just above the St. Martin Rotunda lies a fabulous playground, built from rough timber and surrounded by totem-pole like statues of key players in Vyšehrad's history. Ladders lead up to towers connected by bridges, while "secret tunnels" quickly carry you to the edge of the play area. The playground's surface is deep gravel, forgiving enough to soften just about any misstep by tiny feet. Our kids' main concern was who was going to get to ride the zipline first! 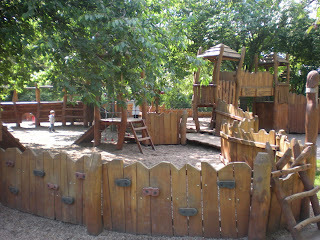 The play area is circled by benches where you can relax in the shade while the kids work out all their wiggles. Don't forget to take in the scenery from the battlements of the castle. With a commanding view of the Vlatava river below and the much more visited Prague Castle and Mala Strana in the distance, it's an unfamiliar, but breathtaking view of the city. 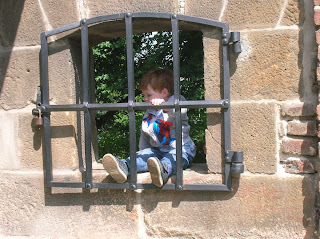 The castle complex is large and fun to explore, but a challenge for strollers - a mixture of cobblestone alleyways, shady paths, and curious passageways through ancient walls and tunnels. The labyrinth just outside the "New Provost's Residence" makes for a fun diversion for the kids. The large lawns guarded by statues under canopies of green are a perfect spot for picnics. 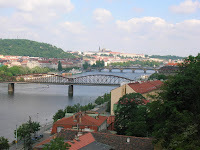 The quickest way to get to Vyšehrad is via the metro - the aptly named Vyšehrad stop on the red line is about a 10 minute walk away.